The all-new Toyota Prius is the most fuel-efficient car in the world (without a plug), and it has been restyled for 2016 with a more streamlined body and scooped-out side contours along the back end. The Prius is losing its wedge, but not its edge. So why aren't you driving a hot new Prius? You don't have to travel very far for a close-up look at Toyota's flagship hybrid sedan. Charlottetown Toyota of Charlottetown, located at 1 Superior Crescent Charlottetown, PO BOX 730 in Charlottetown, PE, just received a nice selection of 2016 Prius sedans in many different trim packages. We can confidently tell you that the plural of Prius is Prii. 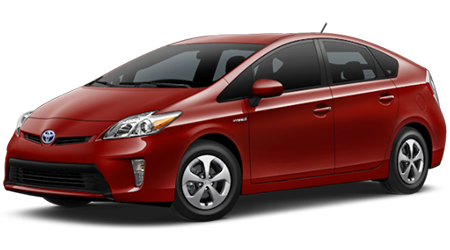 While the plural form of Prius may seem unimportant to you, we have seen many of our customers from Charlottetown, Stratford, Mt. Herbert, Cornwall, Marshfield, Brackley, and Milton Station and beyond buy a sleek new Prius. But they like the high-performance, low-emission midsize sedan so much, they buy another. If you want to see many, many beautiful Prii at the same time, pop in to our Charlottetown Toyota showroom for a game-changing test drive. It Doesn't Look Like A Prius! The 2016 Prius is a far cry from its former self, still sporting the iconic shape and athletic stance, but now updated for 2016 with a more dramatic grille, sportier hood and crescent-shaped headlights. Aside from the fresh accents and eye-candy appeal, the new Prius features many upgrades you can't see. First and foremost is Toyota's revolutionary TNGA body. As an acronym for Toyota New Global Architecture, this truly ingenious system translates into materials that are lighter, yet stronger, than anything else on the market. Some day all cars will be made this way, but today only the new Toyota Prius makes it affordable. Even when you hurry off in your Prius, people will take notice, due to the incredible LED taillights that may result in a rash of reported UFO sightings in the Charlottetown area. Do you remember the word synergy from high school science class? It happens when two parts are combined to form something that is greater than the sum of its parts, namely 51 mpg in the city and 48 mpg on the highway. In the Prius, synergy is created by coupling a dynamic gas engine with an efficient electric motor to create some amazing acceleration and pep. A side benefit is near-zero emissions, so we can all breathe easier with the Prius' Advanced Technology Partial Zero Emission Vehicle certification. If you are still driving a gas guzzler, you are part of the problem. Prius is a big part of the solution. In a friendly jab at rival carmakers, Toyota lowered both the hood and the Prius badge this year, signifying its position as a player in the high-performance coupe sector. This also reduces drag to a co-efficiency of a mere 0.25, allowing it cheat the wind, and a whole lot of gas stations! If you are not driving a hybrid vehicle-shame on you. There are no more excuses. The Prius Hybrid Synergy Drive is indistinguishable from an internal combustion engine in performance, throttle response, and cost. Perhaps you have never been at the controls of a fine hybrid luxury sedan. It is empowering and exhilarating at once. Drop by our modern facility at 1 Superior Crescent Charlottetown, PO BOX 730 in Charlottetown, PE, for a first-hand look at the 2016 Prius in all its glory. Charlottetown Toyota of Charlottetown would love to show off the new restyled Prius, and take you on an eye-opening test drive. We also serve our neighbors in Charlottetown, Stratford, Mt. Herbert, Cornwall, Marshfield, Brackley, and Milton Station, PE, so do not hesitate to visit, call or shoot us an e-mail. We would love to hear from you!